Today I wanted to sftp into the webroot for my server (/var/www) but because of the way the permissions are set up the default ec2-user doesn’t have permission to do this. That directory tree is owned by the user “fred”, which otherwise doesn’t get used. I decided to allow ssh & sftp access to enable this. There’s a pretty good guide to this in the AWS Documentation, but here’s exactly what I typed to get this to work. Note that I’m comfortable giving this information because my server is heavily firewalled, only allows connections from my IP, and requires a private key to log in. First we create the user and give them a password. I’d already created the user a while back, but this is how it’s done. I’m not sure if you really need to give the user a password since login is by certificate only. 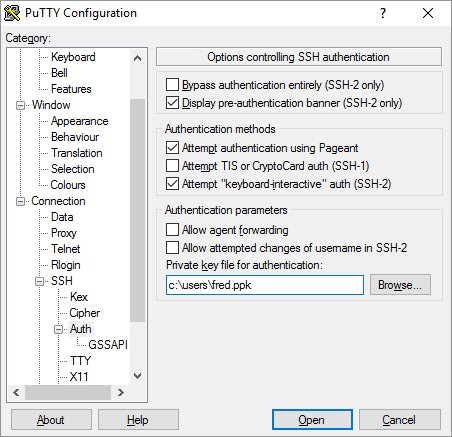 Next we generate the public and private keys, as the user tim, and copy them to the right place on the file system. We have to set very specific file and folder permissions for this to work. It’s good practice to set a password on the private key when prompted. I use FileZilla as my FTP client. 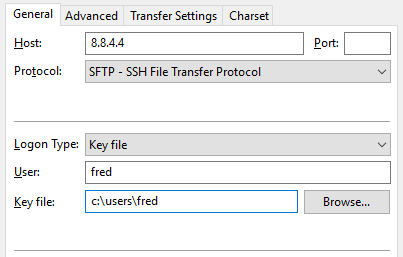 I set it up as per the screenshot below – IP address, “SFTP – SSH File Transfer Protocol”, with user and key set.